Pathways seeks to solve the problems addressed above by providing integrated communication and leadership, improved recognition, real-world applicability, modern content, more choice including tailored learning and online content. Toastmasters as an organization will still have the same essential ingredients such as meetings, meeting roles, table topics, contests and club officers (committees). The biggest difference is the structure of the Pathways, it is radically different to the existing education program. Thus progress toward awards is not transferable between the existing and new programs. This also applies to DTM, DTM continues to be the highest level of achievement that a Toastmaster can reach but there is no option to transfer between the programs. After Pathways rolls out in the last region, there will be a two-year transition period. Which means if you are currently working towards an award under the existing program, you essentially have over two years to complete that award including finishing your DTM. Overall I am optimistic about this new Program but feel that Toastmasters as an organization could have found a solution to allow some form of transfer between the old and new programs. Testing of the content occurred between July to December 2015. The things members liked most were the Modern subject matter, Modernization of content, Videos and Online format. Let’s revisit the 5 key concepts discussed earlier in the context of Pathways. Competencies: The existing competencies will be built upon and increased. The existing program has 68 competencies, Pathways has 250 competencies. Additionally Pathways will focus on 5 key competencies Public Speaking, Interpersonal Communication, Leading and Managing, Leading Strategically and Building Confidence. Tracks(Paths): Paths will replace existing tracks. There will be 10 paths to choose from, members will choose two prior to beginning the DTM criteria. Available paths include Visionary Communication, Presentation Mastery and Dynamic Leadership. Manuals(Projects): In simple terms Projects will replace existing manuals. There will be 59 available projects. Each path will comprise of 10 required projects and 4 elective projects. Each project will include at least one speech. The projects include podcasting, blogging, ethical leadership and conducting online meetings. Levels: Each Path will have 5 levels, Toastmasters will progress through the levels by completing projects. Awards: When a Toastmaster completes a level they will receive an award. There are more levels and thus more awards, which mean more regular recognition. Awards come in the form of badges for each level achieved. As per today there will be the option of a letters sent to your employers. Additionally there will be digital certificates and an email from the International President. 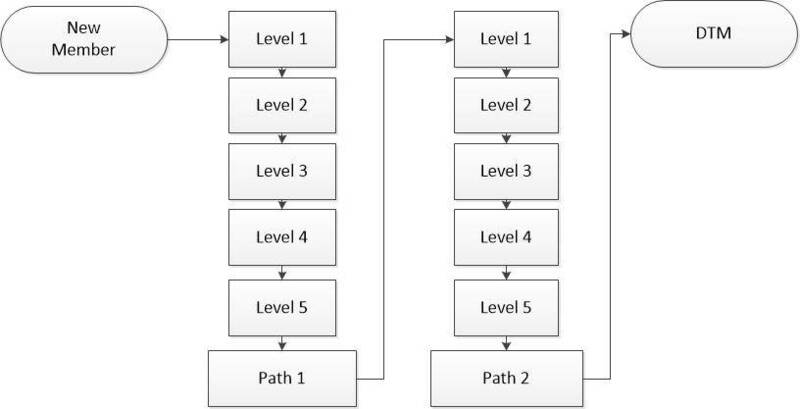 To elaborate a little further in the first diagram below it can be seen that a member will choose a path and progress through 5 levels and then will begin the second path, again progressing through the 5 levels. At this point a Toastmaster is eligible to begin the DTM requirements. In the second diagram below there are 2 sample paths with the 10 required projects to progress through the 5 levels. Additionally a Toastmaster will complete 4 elective projects before completing each path. Base Camp is the online home base for the education program, although members can still use the traditional approach with printed materials. Although the online option is more cost effective. Additionally completing two paths will cost less than currently completing the equivalent levels in the current program (i.e. from competent to gold). The table below explains the costs of Pathways. In simple terms your Toastmaster membership covers the cost of your first path if you choose online only and your second path costs $20 dollars. You can switch to a different path within 30 days for free but it will cost $20 there after. If you choose the traditional printed option this will costs you $25 dollar per path, and if you chose to switch paths the $25 printing fee is non refundable. Currently a Pilot program has being undertaken in 3 districts and the roll out to regions across the globe has begun. The Pathways website has a roll out schedule. The current education program needed to be changed, Pathways seems to have solved many of the issues of the existing program. The integration of leadership and communication skills with the modernization of content can only be seen as a positive change for all Toastmasters. These changes should ensure that Toastmasters as an organization remains relevant to upcoming generations.